In your estate plan, you can appoint a guardian to care for your minor children and a conservator to handle financial affairs for your minor children upon your passing. If there is no plan in place, the court will appoint a guardian to raise your children based on what it deems to be in the best interest of your children. Unfortunately, the court appointed guardian may not be your first choice and in some cases, he or she may actually be your last choice. From just a few brief hearings, it is often impossible for the courts to determine who is best suited to care for your children in your absence. In general, if an individual dies without an estate plan, his or her assets are distributed according to a formula determined by the state. In most instances, these laws pass wealth to both the surviving spouse and children. A properly crafted estate plan gives you control over this distribution allowing you to provide for specific people you designate and at the right time. It is recommended that all parents of minor children create a trust that is designed to safeguard the inheritance for your children. Such a trust gives you the ability to outline how much money your children will receive, the age at which they will receive the inheritance and to an extent how they are to spend this money. This allows you to designate funds for college educations and give an inheritance at a certain age, ensuring that they don’t waste their inheritance on fancy cars as soon as they turn eighteen years old. The trust can also protect against potential creditors or even divorce. 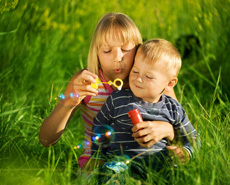 Children are often the greatest assets that parents have and an integral part of the estate planning process. Your children’s well-being is only ensured with proper planning and while most parents hate to think about leaving their children before they are adults, it is essential that this possibility be considered and an effective plan formulated. If you have not yet created a plan that adequately provides for your children, we encourage you to contact our office today.